It’s now official – LeBron James is back where it all started. Back in Cleveland. Back in Akron. Back in the area where the King James persona all came from. Cleveland sports fans just hope that he is back to sign an NBA Championship. This news comes from Chris Sheridan from SheridanHoops.com. LeBron James will be able to don that Cavaliers jersey again & come home, hopefully being able to bring an NBA Championship to the franchise, their first in history. James announced on Thursday, after meeting with Miami Heat President Pat Riley, that he would be going back to the Cleveland Cavaliers, despite all of the bad feelings from fans about 2010, the Decision, & all of the fallout from that. James will have the max contract that he stated that he was interested in in the beginning. It looks as though he will have some help as there have been reports that Kevin Love from the Minnesota Timberwolves would accept a trade to the Cavs & would resign long-term in order to play with James & the great cast of talent around him including Kyrie Irving & NBA Draft #1 pick Andrew Wiggins from Kansas. There is also a chance that James could be bringing in Ray Allen & Mike Miller, players who James played with during his time with the Miami Heat & are key role players who were very instrumental in bringing NBA Championships to Miami. 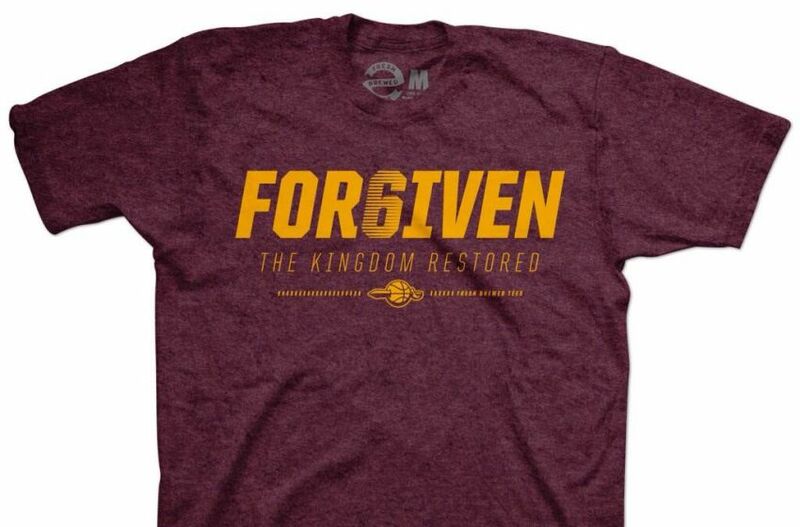 This t-shirt will be available on sale now that LeBron James has gone back home to the Cleveland Cavs. James’ representatives have met with owner Dan Gilbert, who famously wrote a letter that was posted on the Cavs’ website for years since James left the team. James & Gilbert were able to patch up their differences in the name of business & both men knowing that this reuniting means that the Cavs go back to being the media darlings of the NBA again & helps to get back to a championship level. At the end of the day, as the old saying goes, its nothing personal, just business. Will the fans forget about what happened? Not at all. But for a sports town who has had many great athletes leave for greener pastures, this could be absolute major moment in the history of Cleveland sports. Between having LeBron back, having his buddy Johnny Manziel with the Cleveland Browns, the city of Cleveland went from being a sports town that many people didn’t always think about to quite possibly the most important sports city in America for the upcoming 2014-15 sports year. Speaking of Manziel, having LeBron in Cleveland will be important for him as well. LeBron will be a great mentor to Manziel, helping him navigate the waters of being a professional athlete & the pressure that will be put upon him to be great from day 1. James & Manziel are both represented by the same agent & marketing group & have been close since Manziel’s days at Texas A&M. What the Cleveland Browns will hope for is that James can help Manziel curb some of the partying & the crazy life & spiral that Manziel seems to be headed towards with all of the trips to Las Vegas & such – he would be more of a “big brother” type. From the basketball standpoint, it is clear that James will be making a wrong right again according to the basketball fans around the NBA. If he wins an NBA championship during his time in Cleveland, James’ legacy will be set forever & will be a hero to the people of Ohio & will be the biggest sports force in the entire state, even more than Ohio State Football. What About Carmelo Anthony? Los Angeles Lakers or New York Knicks? With James in Cleveland, what will happen with Carmelo Anthony? It looks more & more like Melo will sign with the Los Angeles Lakers or New York Knicks. Both teams have shown the ability to have tons of cap space for Anthony & another big free agent to sign him, though the Knicks can pay Melo $30 million more than the Lakers. Anthony could possibly still go to Cleveland, in theory, but it would be odd for him to go there with all of the young talent that is in place that can be dominant for years to come. Anthony has said many times that it wouldn’t be about money when it came down to this decision, but with his wife La La Anthony looking to make a big mark in the acting world after the success of her reality show, “La La’s Full Court Life,” Los Angeles would open up many more doors for her to go into bigger productions. In New York, Anthony can make much more there, $30 million to be exact, & with Phil Jackson taking over there & making moves already to be a better squad, along with some bad contracts coming off the books in the next year, Anthony has the opportunity to build a potential dynasty in New York City over the next few years, as long as Jackson can keep the rebuilding process going & get rid of the “me” guys & get more of the “we” guys who can work around Anthony’s skills & can get the Knicks back into the playoffs, which keep in mind, the team was a 54-28 team in 2012-13, so they aren’t that far off from being back to what they were before this bad season. LeBron not going to the Miami Heat or Los Angeles Lakers may kill the dream of the two playing together, which both have wanted to do since 2010, when Melo opted for guaranteed money, when it could have been a big-3 of Dwyane Wade, LeBron & Carmelo Anthony in Miami instead of Chris Bosh. My guess will be that he signs with the New York Knicks for the money & for the promise that Jackson, the winningest coach in NBA history, can offer Anthony & the chance to be the complete face of the franchise. LeBron signing with the Cavs will lead to a domino effect around the entire NBA & here are some moves that we can expect to take place very soon. These moves aren’t definite, but would make tons of sense all around the board. Chris Bosh Will Sign With Houston Rockets – Scratch That – Miami Heat. Chris Bosh, according to ESPN, was a big piece of the puzzle of maybe keeping LeBron in Miami, but with the Rockets looking to really make a big move in the NBA Western Conference, the team is offering Bosh a 4-year, $96 million offer, which is the max that a player can sign for on a new team. With Bosh getting the chance to play with Dwight Howard & James Harden, he will get many chances to dominate in the same fashion that he did in Toronto with the Raptors for the first 7 seasons of his career. As of July 12, the Miami Heat organization are working on signing Bosh to a 5-year, $118 million dollar offer, which is the max for an NBA player with their own team. Dwyane Wade Will Be Last Man Standing in Miami. Since Wade doesn’t have as many options as any of the major free agents that are out there right now, Wade will end up finishing his career with the Miami Heat. Wade was the face of the franchise before LeBron came to town, during the time when Shaq was there, when the Heat won their first championship. With the wear & tear on Wade over the last few seasons, he knows that he won’t get major money anywhere else because of injuries. I have a feeling that either Wade will play out the rest of his contract or he may just opt for retirement, knowing that his place in NBA history is secure & his Hall-of-Fame credentials are set. For more information, check out the DraftKingsMaster on Facebook, Twitter, Google Plus & WordPress.